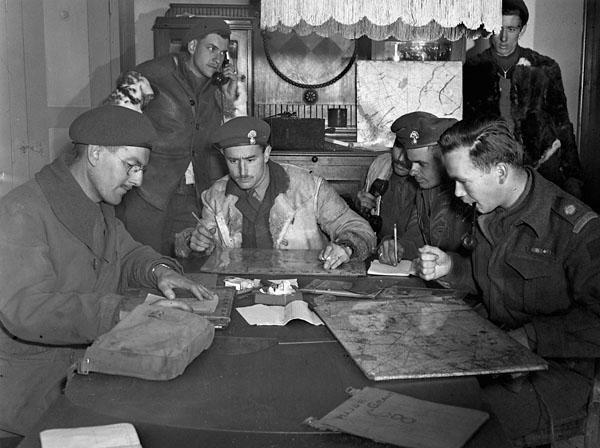 Tactical Headquarters of Les Fusiliers Mont-Royal. Munderloh, Germany, April 29th 1945. (L-R): Captain J.S. Hamilton, Royal Canadian Artillery; Lieutenant-Colonel J.A. Dextraze, Commanding Officer of Les Fusiliers Mont-Royal; Lieutenant A. Gautier and Sergeant P.P. Leduc, both of Les Fusiliers Mont-Royal; Major D.W. Grant, The Toronto Scottish Regiment (M.G.). Photograph by Lieutenant Dan Guravich.